Multilingual dictionaries for English to Spanish, French, German and Italian. Is there a better alternative to One World Dictionary? Is One World Dictionary really the best app in Travel category? Will One World Dictionary work good on macOS 10.13.4? 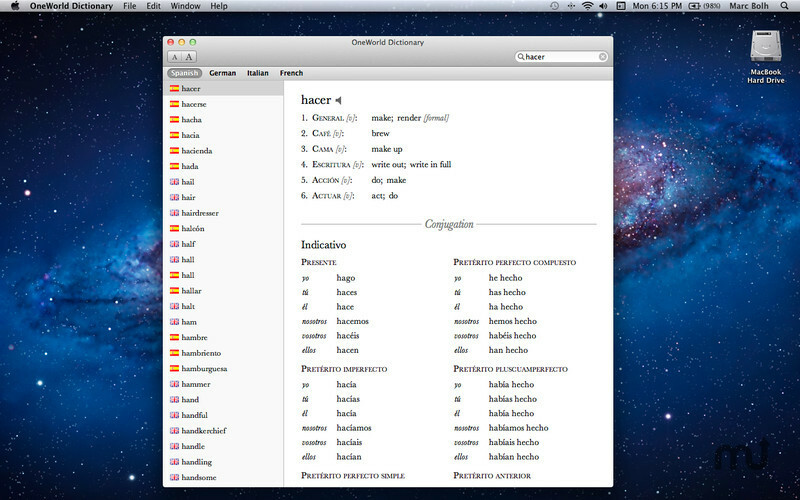 One World Dictionary by Ascendo is a leading multilingual reference tool for Apple desktops. The free version is a good starting point for beginners. It includes over 100,000 translations from English to Spanish, French, German and Italian. Paid versions are offered as in-app purchases (requires Mac OSX Lion). Each language pair is comprised of over 250,000 translations. Translations include multiple meanings, part of speech, noun gender and verb tenses. 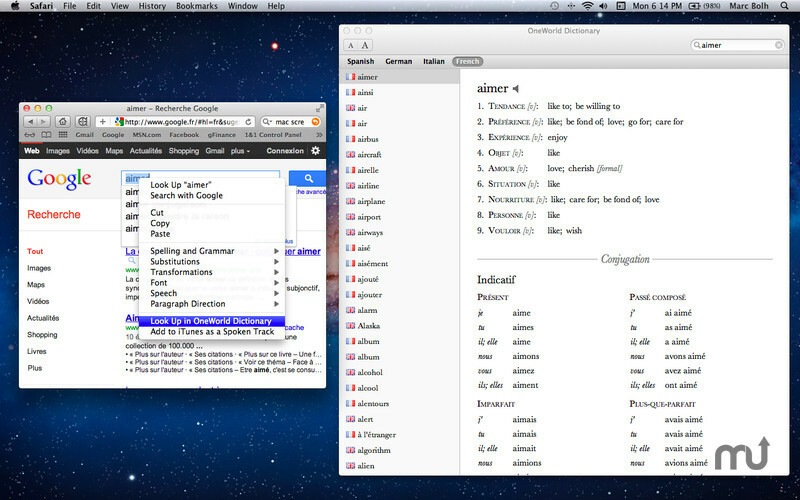 One World Dictionaries integrate with Lion applications such as Safari so you can lookup words using control-click. Added Phrase Books for English to Spanish, French, Italian and German. Free version includes over 200 phrases in English, Spanish, French, Italian and German. In-app purchase of Extended Phrase Books increases number to 528 phrases per language pair. Added search on keyword for Phrase Books. Implemented ability to Add, Edit and Delete sentences to Phrase Book. One World Dictionary needs a rating. Be the first to rate this app and get the discussion started! Integrates with other applications so you can lookup words quickly and easily. Works offline so it's always available. Free version includes thousands of the most used words in English, Spanish, German and Italian. 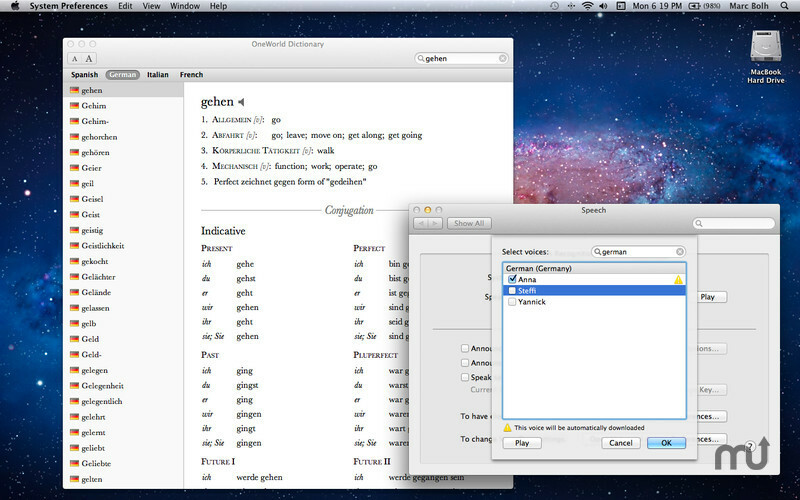 Paid versions, offered as in-app purchases in Mac OS Lion, include comprehensive dictionary databases comprised of over 250,000 translations. Single searchable word index so you don't have to switch language direction. Translations include multiple meanings, part of speech and noun gender. Verb conjugations in all major moods and tenses. Text-to-speech audio is provided in English. Lion users can download free text-to-speech engines for Spanish, French, Italian and English. Lookup words while using applications like Safari, TextEdit and many others by right control-clicking on a word and selecting "Lookup in OneWorld Dictionary". Lookup finds conjugated forms of verbs which make up a large part of any language. Change text size with one click. Added text-to-speech pronunciation for phrases. Improved dictionary entry format to include noun gender for non-US languages after the key word in addition to translations. Other improvements to navigation and in-app help text.